Rock crawling is a specialized hobby. Take automotive off-roading and narrow it down to just one specialize part: carefully climbing up craggy hills and over tall boulders at super-slow speeds. Sometimes done with stock trucks, but usually using highly modified vehicles with huge amounts of suspension travel and fully locking axles so all four tires receive power simultaneously. Awesome, yes. Easy hobby to dive into? Not so much. Not only do you need a tricked-out truck, you also need a location that fits the occasion. Places like southern Utah are a mecca for this type of activity. But those in rural Nebraska have to look hard to find their crawling opportunities. Fortunately, there’s another fun way to rock crawl, on the micro scale. 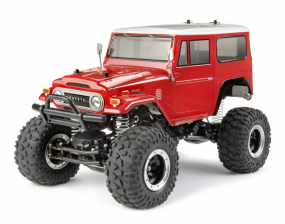 A segment of the RC car community has moved away from racing their high-powered cars in tight laps at the scale equivalent of 275mph, to recreating an accurate hill-climbing, rock crawling experience at 1/12 size. The cars they use are like the trucks built for the real deal: super customized, one-of-a-kind machines that excel in their field, with gear ratios that move them at a snail’s pace. And for the owners of both full-sized and micro crawlers, the fun lies in the build process, sometimes even more so than driving the vehicle. How to go about making your own crawler? You can buy a kit designed specifically for this. You can buy an RC truck and modify it. Or you can build the entire thing from scratch. This Instructable gives you a great starting point to making a custom machine: building the frame. Using metal rods as the tubing and welding it together, this thing will help its tiny passengers survive a rollover from precarious heights. 1. 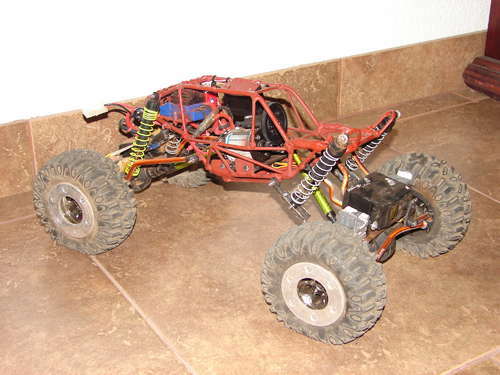 Suspension – This is the key component when it comes to building a good rc rock crawler. Suspension articulation is what you are seeking. Independent A-arm type suspension does not provide adequate articulation for climbing over steep rocks. 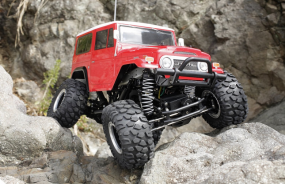 You will need a rc rock crawling truck with a solid front and rear axle, with 4-link suspension. You want your spring and shock combination to be as soft as possible to allow for maximum axle articulation. 2. Chassis – A chassis with a low center of gravity is essential. This may be an obvious point, but moving every ounce as low as possible is going to make a huge difference when faced with a steep incline. If your weight is too high your rc rock crawler will roll over too easily. 3. Tires – You are going to want large soft tires, with an aggressive tread pattern. You want your tires to flatten out from the weight of the rc rock crawler, this will give you the maximum traction when rock crawling. If your tires will not support your crawler without foam inserts, use the softest inserts that will do the job. If your tires are too hard and need some softening you can spray them WD-40 to soften them. The large over-sized tires are needed for ground clearance. 4. Bead-lock Rims – Using bead-lock rims make it much easier in tweaking your tires and foam inserts. It is much easier to add or remove your foam inserts if all you have to do is unbolt the bead-locks. If you are using rims that need to have the tires glued on, you will need to 3, 4 or 5 sets of tires glued up with different inserts or no inserts. I find it much easier to use the same rims and change tiers or inserts. 5. Lock the differentials – This is the number one modification you need to do. In all other types of Rcing differentials are much needed aspect, but not in a rc rock crawler. They are a detriment. When you are working your way over a rock it is usually done one wheel at a time. If you do not have your differentials locked, when you start over a rock the differential would send the power to the opposite wheel that is not under load. When using a locked differential the wheel trying to get over the rock maintains constant power. There are many different ways to lock your differentials. You can pack them with JB Weld, modeling clay or purchase lockers. Using locked differentials will mean that your rc crawler is successful. 6. Stock electric motors – Your rc crawler is not about speed, it is about slow calculated climbing. You want to gear for torque. The objective is for powerful starts to get over the rocks, high RPMs will just flip your crawler over on its roof. So, gear your rc crawler low for high torque and it will be a productive crawler. More good DIY build info can be found here, here, and a series of links found here. One other shared element is the videos these enthusiasts capture and post of their rides. Usually the real ones are part of a procession, like billy goats climbing a mountain in a line, with the drivers of the other vehicles stepping out to guide each other with shouts and whistles. The RC version are impressively shot, some including details that go way beyond just the trail driving. This video is hilariously bizarre, btw.